OCWA—Central New York’s Water Authority—recently was awarded a $846,000 grant from New York State to make safety and efficiency improvements to its Otisco Lake intake and transmission main. The grant was funded through the state’s Water Infrastructure Improvement Act (WIIA), a government program designed to support critical municipal water infrastructure projects throughout New York. 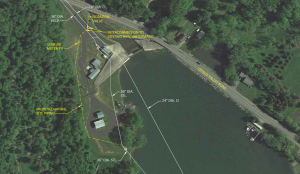 The improvement project involves construction of a new, larger diameter (48″ or larger) section of buried intake piping and valves from the existing 36″ intake where it meets the Otisco Lake shoreline. Otisco Lake provides roughly 50% of the supply to OCWA’s five-county regional water system. The new piping will not only be more efficient, but it will allow the Authority to bypass facilities which are cramped and difficult to access. In particular, a new flow measurement vault will be added as part of the new larger section of piping thereby eliminating the need to access the existing meter which is in a below ground location. The end result will be improved gravity flow capacity of OCWA’s Otisco Lake source by over 1 million gallons per day. This in turn will reduce the overall cost of production by avoiding having to make up this supply from the more energy intensive, all-pumped Lake Ontario source. This project and resulting operational cost reduction supports OCWA’s continued reinvestment in our system and helps reduce the impact to customer water rates by offsetting some of the other system wide project costs. Maintaining economical water rates is a benefit to all customers throughout the service area, not just those customers that receive Otisco Lake water.